Each year about this time, digital marketers are bombarded by reviews of industry trends and projections on what’s to come. It’s all 5 Content Marketing Lessons from 2014 and Secret Strategies for SEO Success in 2015. Leave your marketing plans in the drawer and forget your keyword research docs. This won’t help you with them. Think of it more like hump day material to take a break from the inbox and reflect on how much our industry has changed over 10 years. Here are 10 graphs from Google Trends (focused on the US for consistency and accuracy) that illustrate how we have evolved and why we will all have “hacker” or “influencer” in our job title some day. These terms have search volumes that tower above most others in this post, but the trend lines are interesting. Are people less interested in advertising or has it evolved into more specific practices with different names? Although direct and digital are not mutually exclusive by definition, the way that we refer to them might be. Or is it? This is my favorite graph. Affiliate marketing is falling (which should be no surprise) while content marketing moves in the opposite direction. 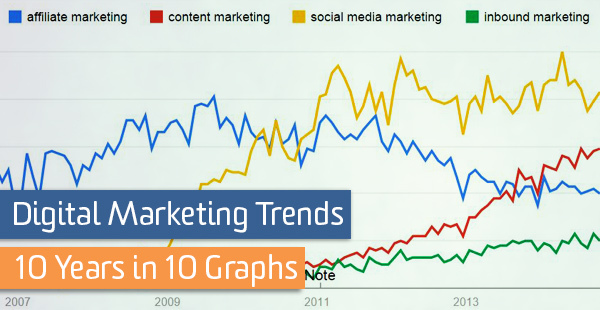 I will be interested to see if content marketing levels off over the next few years similar to social media marketing above it. This graph of big data is misleadingly linear due to analytics. Look at big data by itself (by clicking through to Trends) to confirm its exponential growth as top marketing buzzword of 2014. I would imagine that all of these mobile keywords are in the process of leveling after an initial spike rather than declining. Or are we seeing them lose prominence as they become standard practices for most businesses? I can already see the headlines: “PPC is slowly walking toward the light!” Perhaps the acronym has fallen on hard times, but both are alive and well. Click through to the Trends graph to add “AdWords” or simply look at the Paid Search graph below. Display advertising is an interesting line. With a consistency (in terms of tactic popularity) rarely seen in digital marketing, display continues to go about its business. Call Mashable what you will. If nothing else, it is a great source for buzzwords. If “evangelist” did not have so many meanings, I bet we would see a spike there, too. What other trends do you see? Like I warned from the start, this post was not written to guide your 2015 strategy. But, because it’s hump day, what trends caught your eye and where else should we be looking?